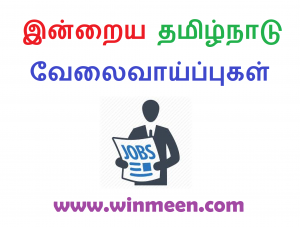 Latest Tamilnadu Govt Jobs 2018 TN Government Jobs Today: Tamilnadu Job Seekers can get Latest Upcoming Tamilnadu TN govt jobs from this page. Tnpsc Latest Recruitment Upcoming Jobs also updated daily in this page. Students those who are completed their graduation and 10th, 12th, ITI and Diploma Jobs also available here. By clicking below links to navigate to respective Jobs recruitment. Every Jobs we have provided Official notification Link and Application Link. Job Hunters of Tn employment, Central Govt Jobs news Seekers must visit winmeen govt jobs page daily and apply the jobs before last date. Considering the above said factors, Every year there was a conglomeration of thousands of Students joins the band of Competitive Exam preparation. They were tailgated normally by the Candidates preparing for the same from the previous year. The result is each year the Competition level of the exam is also going high and often getting modulated. The students were also in a necessity of changing their way of their Preparation every year so that they could withstand in the Competitive Exam Battle and win their war securing a job. Though we know that it not an easy task and it is very hard to do so, but not impossible if you’re determined to do it. You are not gonna do that in single, WINMEEN TEAM is always there for you till you reach the Destination and taste the success. From your side you have to do just one thing that is STUDY STUDY STUDY…. And you have to refer our Official website WINMEEN.COM because we will be enhancing you daily with Syllabus, Exam Pattern, Important GK Articles, Model Questions, Shortcut Tricks, Preparation Strategies. We will also keep updating the Daily, Weekly and Monthly Capsules which will take care of the General Awareness Section. Apart from that Winmeen.com has always been your best Comrade and Well wisher in updating all the Employment news released for various posts across the state which was usually notified by the Tamil nadu Recruiting Organisations. Winmeen Team is also making our maximum efforts in order to provide you the best articles so that the Candidates can ease their effort in preparing the General Awareness section. Kindly keep updating the materials in your mind which we have been posting in our official Winmeen website. Now we gonna provide you some general instructions for the beginners who have just started their preparation for the Competitive Exams. Please provide some attention because most website will not do these types of encouragements but they simply posting the Articles and PDF‘s. We have decided to stay away from those we thought of triggering a positive attitude will surely boost the beginners to prepare for the exams. STEP 1: First you have to choose the Government Job which is exactly suitable to you. Never decide something what others used to today. Though you can ask some suggestion from seniors and relatives the decision to be taken should rely on you. It may be TNPSC, UPSC, SSC or Bank exams but set a single goal in your mind and start preparing for the same. STEP 2: The second important step is to read the notification very carefully and take down the important points. You have to analyse the How to Apply, Syllabus, Exam Pattern, Exam Duration, Number of Questions, Number of Stages( Preliminary, Mains and Interview etc…). This analysis will also help you to apply for the examination. STEP 3: Decide yourself whether you can afford the Coaching centres for your preparation. But don’t rely on them because they will only help to understand the syllabus and providing the materials. The whole part depends to you. You have to Start studying until you made sure of covering the entire syllabus. You should also make sure that you have all the books kept ready for preparation. The money you invest on books will never get wasted and it is just an investment and you will reap them through the job. 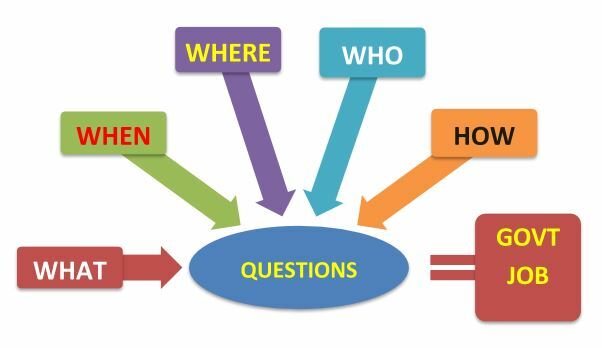 Once you have learned to ask questions – relevant and appropriate and substantial questions – you have learned how to learn, and no one can keep you from learning whatever you want or need to know.” – Neil Postman and Charles Weingarten. STEP 4: Prepare a TIME TABLE and a proper manageable SCHEDULE which should be followed regularly. And the most important point is that you should make notes of the topics if needed. Maintain the notes so that it will help you during the time of examination. STEP 5: Maintain a study gang so that they may teach you some important topic which you may find it difficult to study. The only thing that hinders our preparation is the social networking sites. Try to avoid them if you found them of stealing your time of preparation without even knowing to you. So make yourself strict while studying. STEP 6: Revise the topics every week so that you will keep of updating the materials you have studied so far. Write a test in the same topic with your study gang and evaluate yourself where you are standing with them. Discuss the topics you marked as wrong so that you will not make those mistakes again. STEP 7: Start reading newspapers, browse internet for more general Knowledge to keep yourself updated. Make sure that you are strong your General Awareness section, as it has become an important section for all examinations hold by the government of India. Candidates following these two practices can already make sure that they are able to crack the Examination. “The more that you read, the more things you will know, the more that you learn, the more places you will go” – Dr. Seuss. STEP 8: Once you made sure that you have completed all the syllabus the best choice is to revise them. If you are going to write online examination it’s better to attend the model test available on the net. If test is available for payment the best choice is go for it because the question paper will have good standards and you get an real experience of attending the exam. You can also identify your weak areas and start preparing to make them strong. The more you attend the test the more you will get knowledge. Step 9: You wouldn’t want to fall sick prior to your exams. So Keep 10 minutes of exercise in your schedule daily. A strong health and mind will surely helps you to crack the Exams. If you haven’t take care of your Health and got sick then all your efforts will be of waste. So take care of your health. “SUCCESS IS A JOURNEY, WE HAVE TO CROSS ALL THE STATIONS TO REACH THE DESTINATION”. Latest Upcoming Tamilnadu TN govt jobs 2017 – 2018 details are properly updated in this page. If you have any doubts in vacancies please post your comments below. We are giving Latest Upcoming Tamilnadu TN govt jobs. I am. kavitha. Istading. +2 private. school. teacher. assitant.work pannan. 2years.